Ernest Newman (1868-1959) left an indelible mark on British musical criticism in a career spanning more than seventy years. His magisterial Life of Richard Wagner, published in four volumes between 1933 and 1946, is regarded as his crowning achievement, but Newman wrote many other influential books and essays on a variety of subjects ranging from early music to Schoenberg. In this book, the geneses of Newman's major publications are examined in the context of prevailing intellectual trends in history, criticism and biography. Newman's career as a writer is traced across a wide range of subjects including English and French literature, evolutionary theory and biographical method, and French, German and Russian music. Underpinning many of these works is Newman's preoccupation with rationalism and historical method. 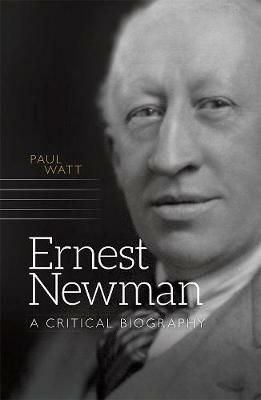 By examining particular sets of writings such as composer-biographies and essays from leading newspapers such as the Manchester Guardian and the Sunday Times, this book illustrates the ways in which Newman's work was grounded in late nineteenth-century intellectual paradigms that made him a unique and at times controversial figure. PAUL WATT is Senior Lecturer in Musicology in the Sir Zelman Cowen School of Music at Monash University.